Dedicatory cartouche in lower center; large scenic addition shows Niagara Falls and a large group of beavers at work making a dam. The lower fourth has inset maps: Gulf of Mexico, Carolina, Charles-Town, and a map of North America. Large map shows the east coast from Quebec to northern Carolina, west to Lakes Erie and Huron. Quite good condition except stained where sections joined. Considerable text included. 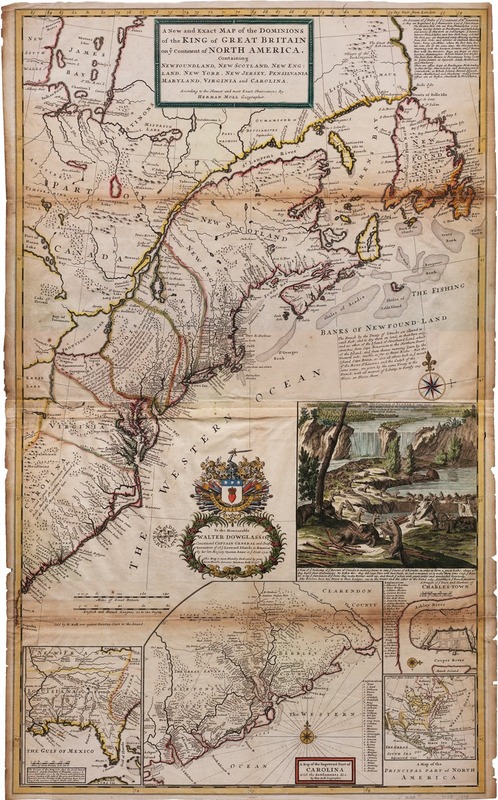 A new and exact map of the Dominons of the King of Great Britain on ye continent of North America, containing Newfoundland, New Scotland, New England, New York, and New Jersey, Pennsylvania, Maryland, Virginia and Carolina . . ., 1715. George T. Abell Map Collection, MC 86. Archives and Special Collections, Mary Couts Burnett Library. https://archives.tcu.edu/repositories/2/archival_objects/14940 Accessed April 23, 2019.